Live video really is the thing to do right now so now Tumblr have decided to jump on the bandwagon and are releasing their own live video feature. On Tuesday 21st live video was launched at 4PM EST with various different streams to welcome users to Tumblr's live streams. The first thing that has to be said is why is Tumblr doing this? If they want to focus on video, then maybe they should improve the video upload system they already have. Every update Tumblr makes, users want to know why they aren't improving the video feature. It might be better than it used to be, but it can still be really awkward to use. Fortunately for Tumblr, they have found a way around this. 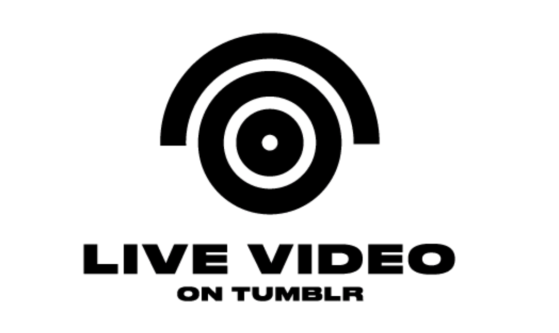 Though this is being considered Tumblr's live video, they aren't actually hosting any of the streams. Users can use YouTube, YouNow, Kanvas and Upclose to record and share their streams. All of these can be streamed from both iOS and Android, apart from YouTube which will remain Android-only for a little while. Once ended these streams will remain on the hosting blog as a video they can watch back. As well as these community planned events, Tumblr will also be allowing users to live stream. These streams will be available to watch off-site, on the dash and on user's blogs like any normal video. This also means that these live streams can be reblogged which could garner them more attention. If someone you follow starts a stream, then you'll get a notification and the video will be pinned to the top of your dashboard. Admittedly, this could wind up being a little annoying ,but at least they've tried integrating the video into their usual post style. You do have to wonder who exactly is going to be live streaming though. This could be useful for question and answer sessions or for providing advice or even just talking about something, but users are used to seeing these as text posts. Tumblr users don't expect to see or share many videos and a lot of users are the type of people who won't want to stream themselves. It's still something I and others will test out, but it's hard to say how it'll actually work on there. We don't know how this is going to work or whether it will beat the odds and succeed. If it does, then Tumblr will be competing against Facebook Live and Periscope, both of whom are giants in the field. Tumblr's live streaming will probably work in the same way as Facebook's, as in the videos that do well won't be serious. Tumblr as a service isn't taken very seriously in general though so if this works, this could be something the service really needs.